When She is in the Meru peak, the AvaraNas are piled up peak upon peak in a three-dimensional manner. It will be in the form of an upright cone. Such a three dimensional configuration of ShrI Chakra is called ‘Meru-prastAram’. People call it just ‘Meru’ colloquially. When the Chakra is two dimensional it is said to be ‘bhU-prastAram’. A mixture of the two, where the beginning AvaraNas rise higher and higher, but later the latter AvaraNas are all in the same plane, is called ‘ardha-Meru’ (ardha means ‘semi’). A pUrNa-Meru is that which has all the AvaraNas in the Meru-prastara style. 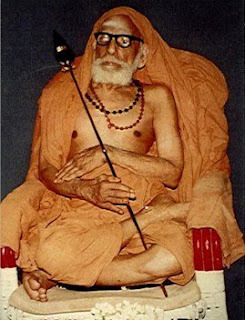 In our Mutt at Kanchipuram and in Tiruvidaimarudur MukAmbal sannadhi, what you find is pUrNa-Meru. In Mangadu it is ardha-meru. In the Kamakoshtam at Kanchipuram it is bhU-prastAram.